1-2-3 PULL! 1-2-3 PULL! Straining to get a good grip on the snowmobile in waist-deep powder, each of us dug for a solid stance and then pulled with all of our might. The machine inched forward. Again — 1-2-3 PULL! As we heaved backward, Matty K hit the throttle and the machine punched out of its pit, up onto the top of the snowpack. The rest of us trudged back to our sleds using the deep postholes we’d previously set in the drift, put on our helmets, fired up our own sleds and continued on. 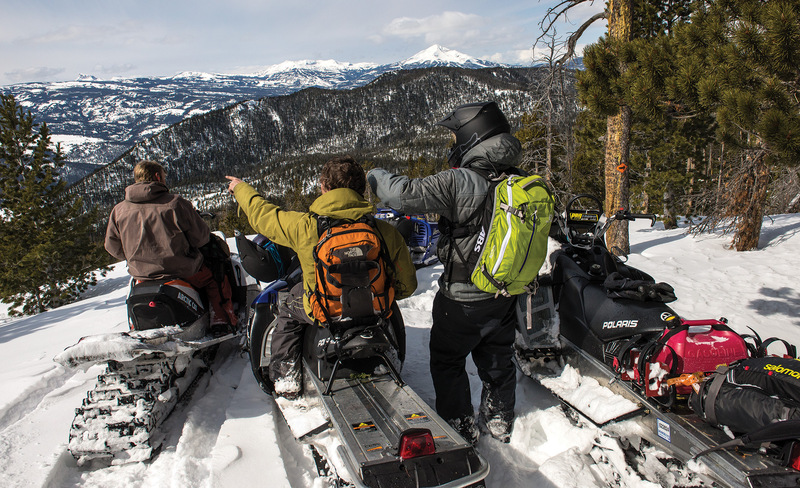 It was a rough start to the two-day snowmobile trip that our group of eight guys had mapped out on Southwest Montana’s Big Sky Trail. The historic route extends over 125 miles north to south, traversing the Gallatin and Madison mountain ranges through deep canyons, thick forests, open range and mountain passes. It’s a challenging trail that offers impressive backcountry snowmobiling and route-finding opportunities for the experienced rider. The eight of us — Jeff Bollino, Ryan Turner, Matty K, Luke Hancock, Brit Barnes, Tony Lawrence, Tucker Vanyo and this writer — were all local riders from Bozeman and Big Sky and had ventured out onto portions of this trail before. But last spring, we decided to attempt the whole thing. Our plan was a two-day ride on the trail from north to south starting at the Little Bear Trailhead near the north end of the Gallatin Canyon. Known as the east portion, as it’s on the eastern side of Highway 191, the trail traverses the west face of the Gallatin Range south to the 320 Ranch through the Storm Castle Creek, Swan Creek, Moose Creek, Portal Creek and Buffalo Horn drainages. From the 320, the trail crosses the highway and enters the Taylor Hilgard section of the Madison Range where it then travels south towards West Yellowstone. Our first day we planned to ride about 60 miles to the 320 Ranch, where we would bunk and get an early start the next day. Like most riders who choose this route, on the second day we would end the ride at the Hi Country Tavern (formerly Eino’s and still-known as such to the locals), just north of the Highway 191 and Highway 287 junction, about nine miles north of West Yellowstone. The Hi Country Tavern is famous for its DIY grilled meats. Patrons step up to the bar, order their preferred cut of meat by the ounce and walk away with a beer in one hand, a slab of raw meat in the other, beelining for the grill to cook it up. The kitchen boasts an impressive view and the jukebox offers an above-average selection; it’s the perfect setting for a steak cooked your way, libations and sharing embellishments of the trail. 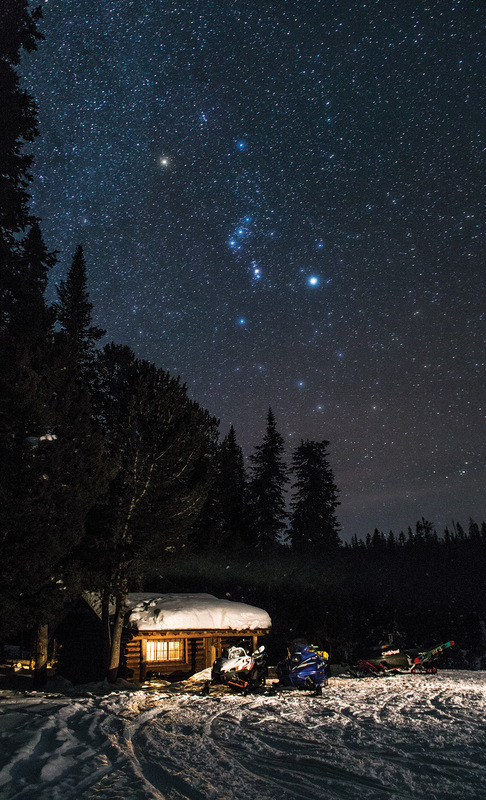 After 125 miles of backcountry snowmobiling in 48 hours, we were counting on some good stories to tell. 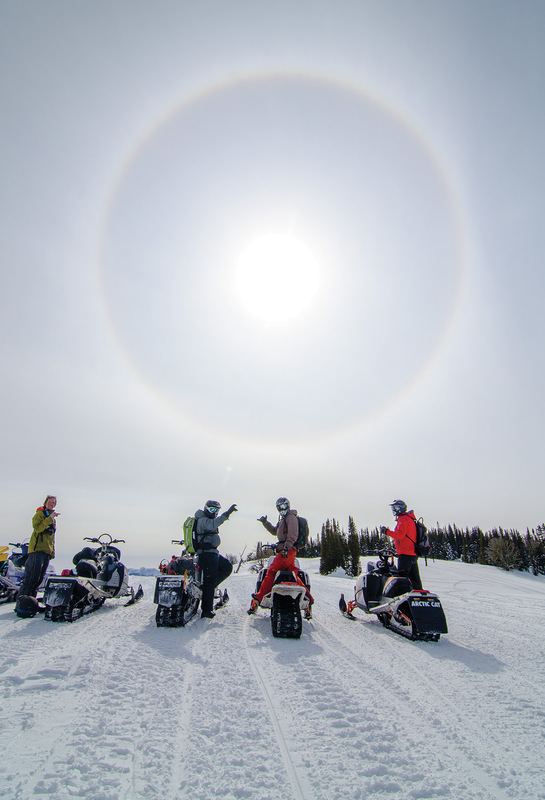 When it comes to snowmobiling in Montana, most of what you hear is about Yellowstone National Park, but just in the area around Big Sky and West Yellowstone there are hundreds of miles of trails on public land in the national forests. The Big Sky Trail was designated for snowmobiling and other motorized users in 1969; it is maintained and groomed by the Gallatin Valley Snowmobile Association (GVSA). The association hosted the first annual Governor’s Cup in 1970; 50 riders entered the snowmobile race from Bozeman to West Yellowstone. Completing the race in nine-and-a-half hours, it was won by a four-man team, riding doubletrack sleds. Just a few years later, in 1972, the winning race time was slashed to 3 hours and 49 minutes by a five-man team. The last GVSA race took place in 1982. Because of that official race and the fact that the GVSA has maintained the trail for over 40 years, it is nationally designated as a Historic Trail. According to the 1977 Wilderness Study Act, this status allows motorized vehicles to travel through certain sections of the Gallatin National Forest. Our group gathered on a Thursday morning in late March to head up to the Little Bear Trailhead. The day before it had snowed 28 inches on top of an already record snowpack. The avalanche danger was forecast as moderate, every member of our crew had rescue gear and the knowhow to use it. Our machines were loaded, we knew the area, had good maps and a GPS. Earlier that morning we’d stowed 35 gallons of fuel at the 320 Ranch, which is about the halfway mark of the ride, and we’d set up a shuttle at Eino’s in West Yellowstone for our arrival in two days. The weather looked good and we had the skills to make this happen. Go time. With so much snow, we couldn’t reach the trailhead with our trucks and trailers. The deep powder meant we’d launch our ride with a route-finding challenge, but we were on a mission and ready for the task. It was 10:30 a.m. before we reached the actual trailhead and, then, just a few miles into the ride, Luke’s sled quit. After a thorough group assessment, we determined it was a fuel pump. Brit and Tony towed Luke and his sled back to the trailhead. They would catch up with the rest of us later. It seemed to be only a few minutes later, just seven miles from the trailhead, when Bollino’s sled blew a belt. He quickly changed it, but that left him without an extra belt and 110 miles to go. With the late start, two mechanical problems and our group separated, an anxious feeling settled on us. We hit the trail with a new sense of urgency. Before long, we were climbing towards Storm Castle up the side of a steep face that drops into the Storm Castle Creek drainage. We stopped to assess the snowpack for safety and to reference our maps and the GPS. We quickly realized we were on the wrong trail. As we turned around to retrace our route, Tony’s sled ski got caught on something under the snowpack, sending him and his machine careening down the steep slope. With a jolt, a small Douglas fir stopped them abruptly. Working frantically, our team used a come-along winch and lots of rope to haul Tony and his sled, inch by inch, back up to safety. Now, it was 1:00 p.m. We were exhausted from the riding and what seemed like constant snowmobile excavation, we had two mechanicals, we were down one rider, almost lost another rider and his sled, and we still needed to find the right trail. We had a long way to go. What followed was some difficult route finding through thick forest. After a questionable creek crossing episode, we emerged onto a freshly groomed Storm Castle Creek Trail. It was 2:26 p.m. We were 20 miles into a projected 60-mile day and the cool air of night was creeping in. We had to make up some time. We climbed out of the Storm Castle drainage quickly on freshly groomed trail and then onto a snow-covered, but previously groomed trail. These were epic trail conditions that made for excellent riding. By the time we reached Portal Creek drainage at 7,140 feet, it was 5:00 p.m. and we were 48 miles into the ride. With night closing in, we knew climbing higher into Portal and then dropping into Buffalo Horn Basin, which promised to be one of the more challenging sections, would be pushing it. We were also running low on fuel. We decided to play it safe and traveled back to Highway 191 to Matty K’s house at Karst Camp near the Highway 191 Portal Creek turn-off. Leaving the sleds for the night, like cord wood we stacked ourselves and the gear into Matty’s mini-van and headed to the 320 Ranch. Steve and the rest of the crew at the 320 always take good care of their guests and they most certainly did that night with plenty of good food and beverage. We were back in our Jefferson Cabin and in bed by midnight. We’d had a big day and the next day would be even bigger. We woke up early, grabbed breakfast, loaded up on gas and drove back to the Karst Camp and our sleds. Today we would ride close to 80 miles. Back on the trail, we ascended the Portal Creek Drainage quickly, cutting through the cool canyon air and then rising into higher meadows under the warm, morning sun. Leaving the groomed section our sleds were breaking trail through waist-deep pow again. This was familiar territory for most of us, but due to the deep, untracked snow we were forced to take an alternate route, bypassing a steep and wooded ascent on our way to the pass that would allow us to descend into Buffalo Horn Drainage. This section of the trail requires familiarity with the landscape as much as a map or GPS. Dropping into the drainage can also be challenging. It requires commitment; the forest is thick, the descent is steep and turning around is not an option. The controversy arises in the definition of use. The Forest Service says it means amount of use. Citizens for Balanced Use say it means the type of use. “There is a big difference,” notes Kerry White, an advocate for balanced use in our National Forests. 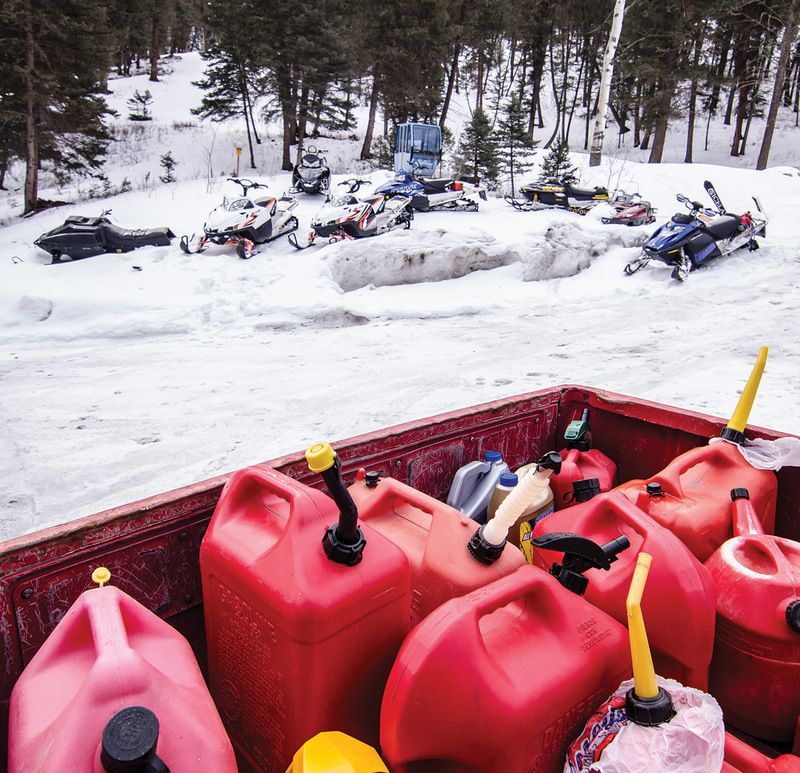 The Gallatin Valley Snowmobile Association is one of over 30 Montana Snowmobile Associations and receives funding from Montana’s fuel tax. Last year, the group spent over $30,000 grooming the trails for recreational use. 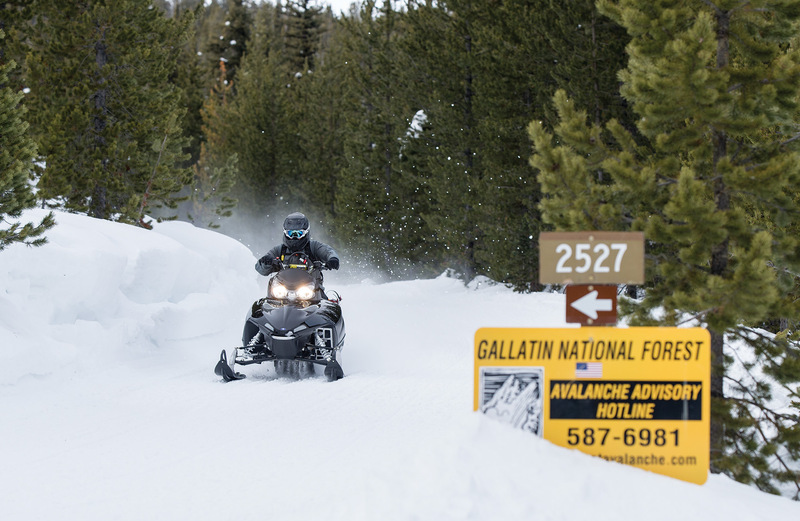 Of the 1.8 million acres in the Gallatin National Forest, 350,000 acres of Gallatin National Forest remain open to snowmobiles. 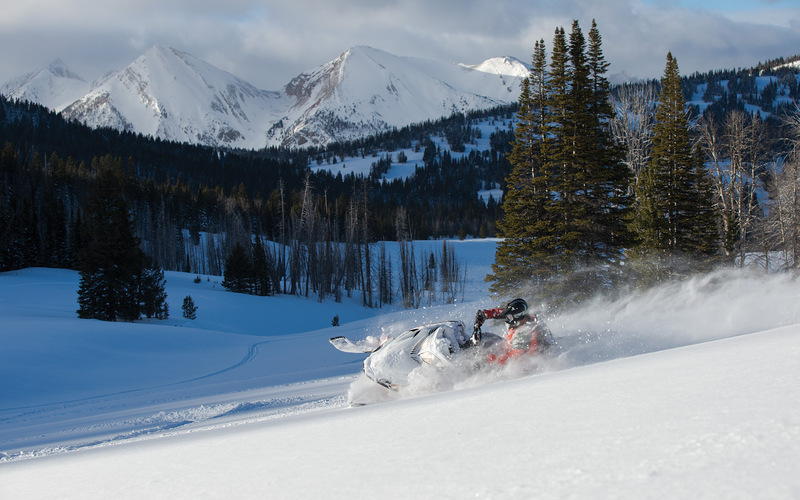 Winter snowmobile use in the Gallatin National Forest generates over $60 million of direct spending every season. Our group took a short break to hydrate, grab a bite to eat and take in the views at the top of the pass before dropping into the Buffalo Horn Drainage. We decided on who would lead this next section, started the machines and the group took off and so did I — right over the handlebars! My track had seized. My chain case cracked and the drive chain was jammed. It was 11:00 a.m., we were nine miles from Highway 191 at 9,090 feet and I was broke down good. I radioed the other riders just seconds before they committed to dropping into the basin. They returned and after some discussion we decided that four of us would continue on the trail, while Matty K and Bollino would tow my sled and me back to the highway. After a great effort, the deep powder proved that towing my sled would be impossible on that day. I would have to leave the sled and return at a later date to either fix it in the field or tow it out when the snow became more compact. I jumped on the back of Bollino’s sled and we headed out. Fortunately, we made it back to the highway and Karst Camp without any other incidents. 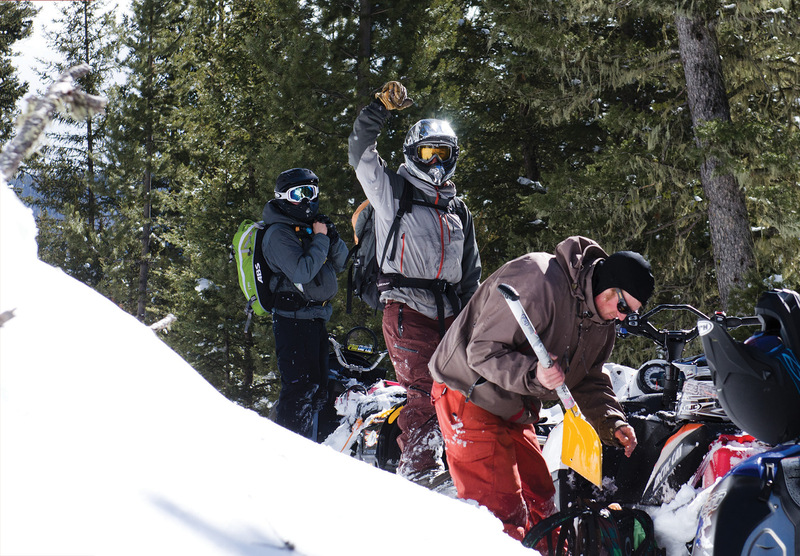 With plenty of daylight left, Matty loaded up his sled and drove it to the 320 in time to meet the other riders who had successfully navigated the Big Horn section. Bollino had a gig in Big Sky, so he hit the road. Disappointed, I drove back to Bozeman and started ordering parts. For the rest of the riders, the ride on the west section went smoothly. They passed through corridor of the Lee Metcalf Wilderness, arguably the most rugged section of the Madison Range known as the Taylor Hilgard area. Here Hilgard Peak towers at 11,316 feet, the second tallest in Montana, amongst a host of other 10,000 footers. This section also boasts large open meadows that allow riders to get off trail to explore and play. This is a familiar section for many local riders, including those from our crew, and a great way to finish the 125-plus mile Big Sky Trail. In the end our group faired well. We were pretty efficient considering all of our inefficiencies. No one was hurt and five out of eight guys completed the mission. Not bad. Nine days after the trip Matty K and Ryan brought me back to my sled. We towed it out and I rebuilt the chain case over the next few weeks. Who knows, maybe this year we could try and break that 3:49 record from 1972. It’s hard to say exactly what lies ahead when you are on the trail, and that might be the most beautiful thing about it. Editor’s Note: Winter travel in the backcountry is risky and is for experienced recreationists. 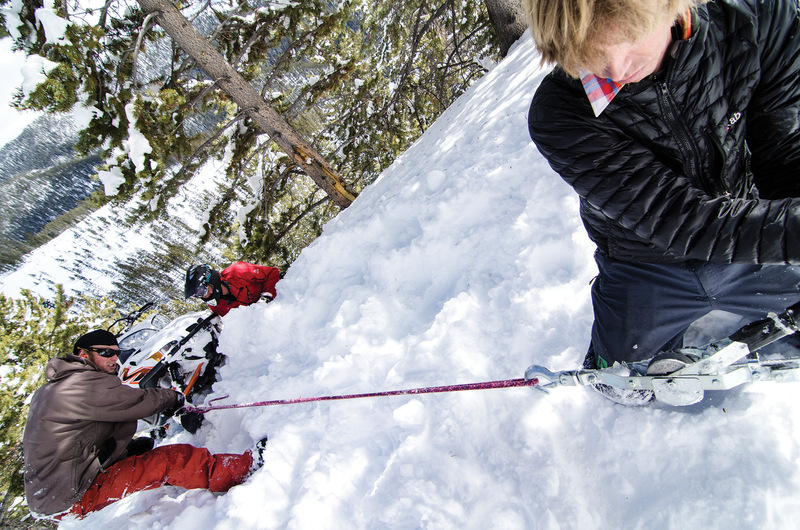 Always check the avalanche conditions when making plans to be in the backcountry. In the Bozeman area that can be done at Gallatin National Forest Avalanche www.mtavalanche.com. Pack appropriate emergency gear, know how to use it and use caution. Check the grooming report gvsa.net/Trails_Grooming or call GVSA for trail updates 406-209-3289. Riders can cache fuel at the 320 Ranch or the Taylor Fork parking lot. The Gallatin Valley Snowmobile Association maintains over 142 miles of trail every summer and groomed over 2,500 trail miles in 2014. These trails are popular for skiers, skate skiers, snowshoers and snowmobiles alike. Riders work together to keep on keeping on through deep snow, advanced terrain and difficult route finding conditions. The Big Sky Trail offers excellent groomed and un-groomed trail options as well as plenty of off-piste opportunities. A come-along winch may prove to be an invaluable tool. The trail offers plenty of great mountain vistas including peaks of the Madison and Gallatin ranges and, on a clear day, it’s possible to see Wyoming’s Tetons. 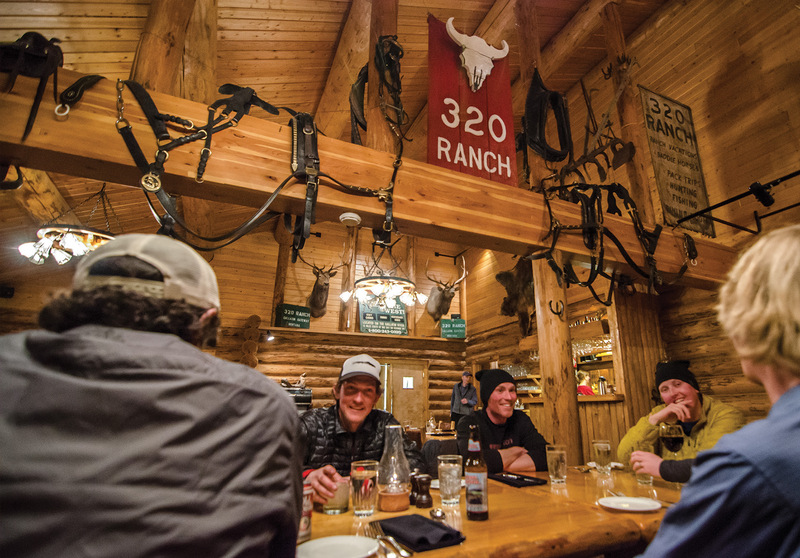 The 320 Ranch is the trail’s perfect mid-way point for food, beverages and a comfortable overnight. Several National Forest Service cabins can be accessed from the trail offering overnight riders alternate lodging options. Our group of friends may not have broken any records but we sure did have an awesome adventure.